how much po cottage for overnight good for 4? good day! ask lng ko tni kng tg pila room nyo gud for 2 person, were planning to visit ur resort this may 17-18, 2014.. here is my contact #09075554870..tanxs..
gud morning.,.mangkot q tne kng tgpila ang rate sng rum nyo for 2 prson?..tgpila entrance nyo? Hi! i need quotation from your resort. for 20pax/ 2 nights. tag pila ang entrance..? pwede ka dala pagkaon?may ara bayad kung magdala kami pagkaon? anu oras ang check in..?kag nu oras ang check out..? may ara kamu da wifi..? After my contact, I wanna visit your resort. Hi.. All rooms has tv sets? Tnx! Hi.. Do you have Rooms with Air condition and Cable TV?? thanks..
good day, i would like to inquire if how much will be the cost if we stay only for a day? how much is the entrance fee and the cottages were we can leave our things and be secured? magkano po ang entrance fee at may overnight room po ba kayo na good for 15 persons at may jeep po ba diyan na pwede masakyan anytime na uuwi na kmi? please send me a room accommodation for more or less 15 people...i need some details asap please text me on 09156846521 how many minus travel po from port gling pulupandan going to ur resort? can you give me more information on how to get there?we are planning to go there this december.allowed ba ang outside foods?at may entrance fee ba? hi do you have contact number where i can contact you? how much the 10 pax for last week of oct.
TO: MAYCE - scroll down or open recent pages you will find the numbers. Texting or calling the resort is more convenient that using email. i would like to know if you have a contact number and email address. i was there this weekend.. the beach, the view, the sand? so calming, so scenic, you'll forget how stressfull life is.. what i'm after at is time to relax and experience nature in it's most natural and modest form.. i disagree to anyone who says the staff aren't accommodating or nice.. whatever maybe their negative reactions were, it's just a response to a stimulus, cause and effect.. how can you expect someone to be nice to you if you aren't either? already planning to go back there.. before i would always consider boracay to de-stress but now not anymore..
My advise to all new comers and expecting to visit Guisi is 'do not expect too much', plan well of how to relax and enjoy the ambience it can offer. This can only be achieve by not relying too much on the services provided by wherever you are staying. As long as you have been given a comfortable bed (if paid for) have faith on yourself to achieve what you came for. Others are not there to entertain nor provide everything for you. Experience the untouch surface of Guisi as it will one day be destroyed by the grandeur ideas of money making mentality. Feel privilege to have come, see and a part of this natures beauty. "WELCOME TO GUISI"
Hi, I texted the smart # however , it says we can have the family cottage at 1300 good for 10 persons. I want to ask as well, if it is good for over night stay as a ROOM the 1300 php cottage or do you have different rate for rooms? I texted the # , sad to say no reply. we are planning to go there ds may 6 and will go home on 05/07. hi we're been to guisi last week. we stayed for 2 nights and 3 days for a group of eight from manila. we have our own food for the first day and order a food for the last two days. people there are accommodating, just tell them what you want and they will provide. yes they are just starting, facilities are limited. and the place is clean. thanks and more power . . .
Lat April 14-15 with my husband, we've been there in Guisi. In our case we never experienced any bad treatment in there. In fact there was a guy who offered me a plastic of Indian Mango for free and i'm happy that he did that because i really love to eat indian mango. People there are accommodating and easy to approach. I just don't like the open hole that serves as window in their comfort room. I hope for more improvement of the place. Good Luck! To Angie: I suggest just keep trying,can't really help you more than these two numbers especially living in the other side of the world. Manang Josie will try to get back to you if you text her your dates and yes best to take your favorite foods with you and ask them to cook it (only basic cooking ha, not complicated one's). There is a small shop for drinks, snacks and tin stuffs but not a canteen yet. I would like to inquire about the cost of the cottages for the 10 pax, & If ders an entrance fee.. Im calling your contac number but i couldnt reach.. can u email me asap about this. & Can we bring foods? & if ders a canteen in the resort? Guys - text 09195636688 and ask for a text back or try 09174179624 for a formal request, signal is their main problem in the area. Capturing it do take 'lucks.' But I will text a suggestion to use a relatives number where signal is permanent and perhaps send a note to the owner about your queries. This 'I think' would solve all the delays and unanswered calls/text. are there other numbers for this resort? i've been trying to call the numbers posted. nobody's answering..
Mey I do apologize, try 09174593856 but perhaps they have been getting a few hoax text or call, I have relayed your message. Just keep trying. . .
Patron/guest seeking for a faster reply - please ring or text direct to 09195636688.
what if we are 7-8 persons,how much is the room rates for fan room only?? hi! i would like to inquire regarding your facilities there. do you have cafeteria?and if the fan room for 4 persons has its own private bathroom? hi.. just wanna inquire how much is ur dorm type cottage for 15 pax?? and can u send us more pics pls. Hi, Just want to inquire for fan room for 8 persons on April 1-3.I need your response asap. How can we get there we are from Bacolod City. Hi! I would like to inquire if how much would be the rate of your air condition room for 6 pax? For 3 days and 2 nights on March 27-29..hope to hear from you soon.. thanks! How much does a room rate cost for 7 pax? standard non-aircon? How many hours is the travel time from the new airport to the resort? Re-Natalie - Pamboat ride from Iloilo to Jordan via Ortiz, then a jeepney ride to Dolores but ask to be dropped at Guisi. Re-Rose ann - call or text 09195636688 for your inquiries. Re-Jay - Prices as it stands (see above), pictures unavailable but you will find Guisi mainly untouch,unspoiled and I would recommend snorkling to see the full package of Guisi beach. Re-Marigold - Prices are as above. Food - best to take what you need/want, you can request to have it cooked for a small fee. Nang, took the liberty of replying to some queries here, hope you don't mind, do let me know if it's a problem. Happy fiesta to all.. not sure when but I am aware it's this month. Love u lots. . . .
please email me rates good for 10persons for feb 13-14. are there food choices also in the area? can you send me updated room rates and some more pics? thanks! hi, one of these days we have plan to go in guisi but i don't have contacts number of you, please email me your numbers, thanks. hi, if ill be in iloilo how can i go in your place? A BLESSED 2010 sa inyo tanan. . Kby ur all well and healthy and hope to see u soon. Hugs and kisses to all. . .
will be in guimaras for an overnight stay on feb 11 -12. how much is your aircon room rate for 2 pax? 4 pax? please advise. thanks! how much is ur rate for non aircon good for a couple and ur phone number also. salamat. Nice place...really, really nice. me and my teammates can't wait to go back. I just love the water and the sand...and the beautiful rock formations. whats your contact number pls? can i get you contact no; cel or landline..i want to inquire for your rates..pls reply..thank you. room rate good for 3-4 persons..tapos if you have a destination tour arrangement or an island hopping tour...how much is your entrance fee? do you have a room good for 2-3 persons which the cost is lower than 1,000.00? gudday!! i just wanted to know if you have cottages for an overnyt stay which is cheaper than to those prises posted above that could accomodate 30 persons.. and kong pwedi magdala ng food and other neccessities..thank you.. i need to get ur favorable reply to this inquiry. were planning to go there by this oct. 25. Pls. send room rates for twin sharing. thanks. gud day! can i ask for your contact number for reservation? thank you! 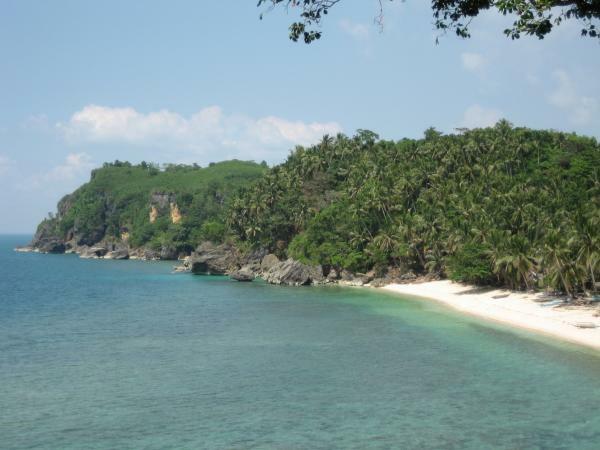 nu pala ung mga facilities of guisi beach resort....i am to promote it through my term paper. i am also a guimarasnon..pls do email me @ julxgab@yahoo.com...pls send me too more info about guisi...thanks! 09195636688 u can contact here if u have question buot guisi clearwater resort. thank u!! Hi! I would lke to know if do you still have an available room for 10 pax for Sept 17-18, 2009. How is the rate? Please let me know also how far it is from Iloilo Airport. You may contact me to my mobile 0917-865-6685. Thanks. Hi! I would lke to know if do you still have an availbale room for 10 pax for Sept 17-18, 2009. how much would be the rate. Pleaselet me know also how far it is from Iloilo Airport. Thanks. Hi, Good Afternoon! I would like to inquire, how long will be the travel time from Iloilo city to Guisi Resort? Do you offer Island Hopping good for 2pax only? how much it will cost then? I'm hoping for your response. Thank You! Hi! My friends and I will be going to Guimaras on the 21st of June. We'd like to rent a family room that would be good for 6 people. Hope you could let me know how to make reservations for Guisi. Thanks a lot. hello! wanted to inquire if rooms are available for 30pax? coming this sat-sun may 30-31. can we bring in food? thanks! may i know ur landline no?? how far is the resort from guimaras port?? may I ask for the landline number for inquiries? hi, i would like to confirm if the aircon rm for 2 pax has it's own private bathroom? Also, pls include the check-in & out time upon & inclusions? we are planning to visit iloilo this coming august & we're trying to search for a affordable & nice resort. I'm interested in your place so can you pls send me your contact no for my inquiries? hope to hear from you soon! thank you! do you have a contact no. ?and can i inquire airconroom for 20 pax?m may 23 to 25? hi i would like to reserve on april 18, 2009 a cottage for 10pax worth 1,300 an overnight stay. by the way im the one from bacolod who called for reservation to Miss Josie. Kindly confirm it at my email add. Thank you. An apology message to all those who waited and still waiting for replies on behalf of the management (Manang Josie). Due to an internet connection problem there will be delays on attending to all your queries via here. Kindly text 09195636688 for a quick reply. hi, do you have pictures of the rooms? and do you have discount rates for those who are staying for more than 2 weeks? my family and i plan on an overnight.my vacant room pa ba kayo?good 4 7(pax)fan room.thanx. josie, is your family name Gaitan? kindly send me other pics pati ng mga rooms nyo. kmi mag asawa at 4kids. kasya nb kami dun sa 1,600 na aircon. by june ang plan ko na pumunta dyan, 2N/3D. gaano pa katagal ang byahe papunta dyan from the airport. nid to know asap so i can book our flight. miss josie, is the celphone # that you posted still valid? gusto ko po sana mag inquire regarding reservations & price quotations po ninyo jan, pati na rin po yung transpo from iloilo city to your the resort. thank you so much! can we have reservations for april 11, 2009 overnight only gud for 5-6 persons. hi, just wanna ask your room rates for the month of april.do we need a reservation in going there? thanx. my friends and i are planning to go there for an overnight on april 3-4, 2009. how do we get there and can i have your contact number so i can make reservations before the said dates? My family plans to go to your resort on April 1, 2009 for overnight stay in one of your aircon rooms. How much is the room rate, meals? How do we go to your resort? We shall be coming from Iloilo. Please advise, thanks. hi, id like to inquire about fan room for 5.. can you give me a quotation for may 10-12? also, whats the fastest way to dolores from bacolod? thanks! cheapest aircon room offer for three persons pls,3 persons..we'll be arriving on mar 11 and staying til the 13th..
i really recommend Guisi Beach Resort. Been there once and I'll tell you it's very relaxing. If you want to have a real relaxation this resort is for you. Not to mention that the resort owner provides various activities for you. to judy hi here's my celphone #09195636688 or 09174593856. thanks for inquiring. good day. tO JAZ: fAN ROOM FOR SEVEN PAX IS 1500. PLEASE INFORM US FOR YOUR RESERVATIONS ON THE GIVEN CELFONE NUMBER 09195636688 AND LOOK FOR JOSIE.